Today was Day #4 of Chocolate and Peanut Butter Theme Week. 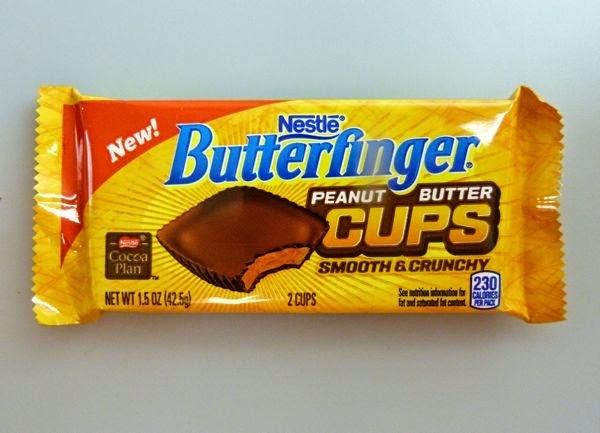 Nestle's Butterfinger Peanut Butter Cups really are a perfect fusion between smooth peanut butter cups and a crunchy Butterfinger candy bar. 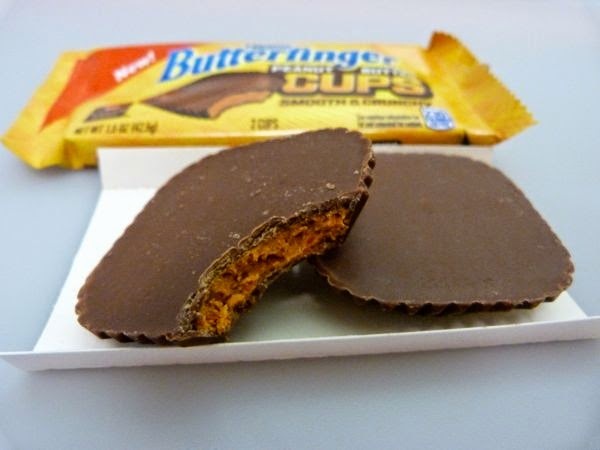 Executed in filled chocolate cup form, these chocolate and peanut butter confections are sure to satisfy a sugar craving. I'd rather skip the lactose and the hydrogenated vegetable oils, but these flavors do bring back fun childhood memories. However, if I'm not mistaken, there is good news too. Any artificial food coloring that might have been used to amp up orange-gold hues, has been replaced by more natural annetto and paprika extract coloring. Nestle also has formulated a program to help support cocoa farmers, with their "Nestle Cocoa Plan," (launched in 2009), represented by a logo seen on this package. The program is focused on farmers in West Africa (Ivory Coast, Ghana), where much of the world's cocoa is grown, largely on smaller farms, with the goals of improving the quality of farmers lives and the disease-resistance of cocoa trees. Part of the training for farmers there involves the introduction of more disease-resistant trees. And, regardless of how you may feel about this and related subjects (GMOs, plants that may require more herbicides pesticides, etc. ), the program also supports building schools and providing other support services. One can hope that child slavery issues are being addressed, directly or indirectly, with this funding as well.